We like to take contrarian points of view. Especially when it comes to business. And sports betting. But that’s another post for another day. In business, if everyone was right about everything–or followed the herd mentality–then just about everyone would be rich, right? For example, in a million years would you have ever thought there would be a SIGNIFICANT monetization opportunity with free-play poker where you sell something called “virtual goods” — i.e. buying your tablemates things like dandelions? And that you could get people to buy chips but never allow them to cash out any money ever? Sounds ridiculous, right? Well, Zynga Poker is the largest online room in the world by a large margin, it’s free-play, you can buy your tablemates dandelions, your money is essentially Hotel California’d (it comes in but it never leaves)– and the company is about to have an IPO worth seventy-bazillion dollars. So sometimes, it’s good to zig when others zag. But maybe there was a contrarian point of view we were missing. And guess what, we found reasons. According to multiple sources, Full Tilt Poker was still making $1M-1.5M in revenue per day after Black Friday from their global (mostly Euro) customers. Let’s take the conservative number and say it was $1M/day. That’s $365M in revenue per year. In the past, Tilt’s margins were out-of-whack. They spent money like a 1998 dot-com. They had 225 total pros on the team, meaning they had about 200 too many. And of course, there was that $450M-ish in shareholder distributions over the years. We can eliminate that off the books. With that in mind, let’s assume they get their margins to something respectable (i.e. Stars-like) at 25%. If they did that, they’d clear about $90M in profit a year. Over five years, assuming no growth or improvement in margins, that’s $450M. That’s a lot of revenue, but we’ve speculated that the total acquisition cost would be around $700-800M. That’s an insane amount of money. How would Tapie recoup it? Typically in these types of “distressed” asset acquisitions, five years is about the max a purchaser will wait to recoup their investment. Are we overshooting the actual acquisition nut? Possibly. Tapie and the DoJ have reportedly struck a deal to repay players. The DoJ will reportedly create a fund, Tapie would presumably infuse said fund with cash, and players would be paid via the DoJ. That out-of-pocket-Tapie-will-never-see-it-again figure is around $130M. Then, there’s the matter of paying the DoJ fines. We’ve written before that the precedent set by the unfortunately-named Anurag Dikshit and PartyGaming is a good measure. That was around $450M. The DoJ has already confiscated about $159M in funds, according to Subject:Poker. So let’s now drop the settlement amount to around $300M. And also, let’s assume, like with Party, the money will be paid in installments. Then you’re looking at a likely $100M spread over three years. Tapie would obviously need to cover all European balances too, but we anticipate most of the money will go right back into play. Regardless, those balances equal approximately $150-200M (to keep the math simple, we’ll say it’s $170M, meaning the total global amount owed is $300M, which was the amount reported recently in the Wall Street Journal). Let’s assume another $20M in other liabilities, to be safe. Of course, there will need to be a funding of operations and marketing. But if they’re cash-flowing and profitable right out the gate, which we think they will be, then those costs may only be a few million, we’ll put it at $5M. So now, what’s the total gotta-have-it-on-day-1 nut for the Groupe Bernard Tapie acquisition of Full Tilt? More likely around $425-450M. Assuming just the status quo with no growth or improvement in margins, Tapie-Tilt makes that $425-450M back over five years ($90M profit x 5 years = $450M). Now–they’d still owe the DoJ $100M or so a year for two more years, so in our hypothetical scenario, Tapie would be profitable (by a little bit) on the investment by Year 6. That’s not fantastic, but it’s way better than we first guestimated, which was about a 10 year wait until return. Now let’s assume that the new Tilt would experience growth in revenue. Just a slight up-tick in revenue from $1M per day to $1.5M per day makes a big difference. We’ll go ultra-conservative and say that they don’t up-tick to $1.5M in daily revenue until Year 3, and then they just stay there with no future growth for three years. Instead of making $365M a year, they’re making $547,5oo,000 a year. At a stagnant 25% margin, they’re clearing $136,875,000 instead of around $90M. And now they’re just about break even by Year 5, and all of Year 6 is gravy. If [Tapie] were able to increase the margin (or the revenue) a ‘healthy’ amount, they could probably unload the company in 4 years as a “rehabilitated” brand. They’d presumably have the 90MM/yr x4 years = 360MM, so halfway back, and by that point if they’ve pushed the NOI up to 120MM a year they could probably sell for $600M – $1B. Even if they didn’t want to sell Tilt and keep running the company–they could still significantly increase their revenues and make more money back via two channels: 1) getting the DoJ to agree to eventually let them back in the U.S., or 2) opening up a sportsbook. While we believe the chances that Tilt is ever allowed back in the U.S. is essentially a one- or two-outer, to paraphrase the immortal Llyod Christmas, “you’re telling me there is a chance.” If that happens, bump up revenues even more. And if Tilt is never allowed back in the U.S.–then there is absolutely no reason why they shouldn’t follow suit of every other major gaming brand in Europe–other than PokerStars that is–and open up a sportsbook. They’d have incredible liquidity from on their existing customer base. And while the life-time value of a sportsbook customer is less than that of an online poker player–every single poker brand in Europe that has a sportsbook makes way more off the turnover (wagers) than off of rake. 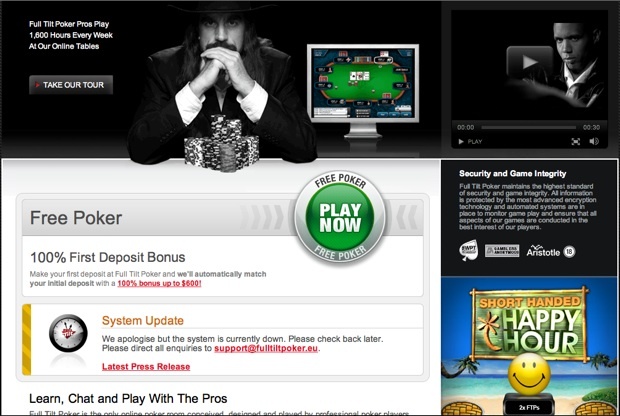 Just look at the dispartity of Bwin.party, where poker only accounts for 17% of total revenue. So there you have it. To the contrary of what we were thinking, the potential Tapie-Tilt acquisition may not be that bad after all.